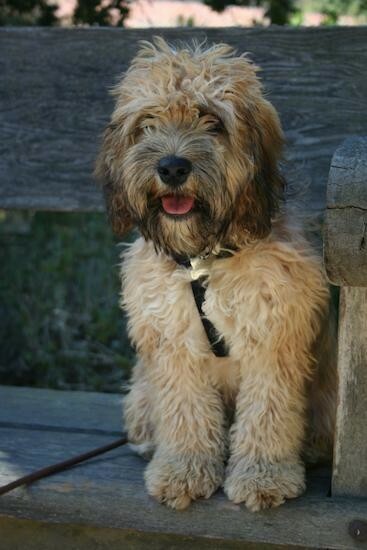 "My dog Mine is a Soft Coated Wheaten Terrier/Cocker Spaniel mix. She looks like a Wheaten, aside from the Cocker ears. Her size is slightly smaller than an average Wheaten. She is wonderful with children and other dogs. She has a strong tendency for dominance, and needed training in order to curb this trait. She sits on our Pit Bull's head every chance she gets, but she no longer tries to dominate her human pack members. She is definitely a water dog. She absolutely loves water and snow. She has a soft mouth, and was pretty good about not chewing on anything other than her toys during the puppy period. It was moderately difficult to kennel train her, although I attribute this to her being a pet store puppy. It took about 2 months to train her not to pee in the kennel. I broke her of this by getting up every 2 hours during the night to let her out, eventually extending the amount of time between potty breaks. She needed to be watched or kenneled constantly for the first 2 months to prevent accidents in the house. She had no accidents after the 2 month period." The Cocker Wheaten is not a purebred dog. 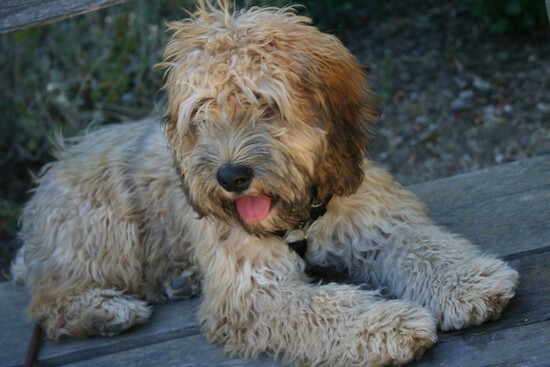 It is a cross between the Soft Coated Wheaten Terrier and the Cocker Spaniel. The best way to determine the temperament of a mixed breed is to look up all breeds in the cross and know you can get any combination of any of the characteristics found in either breed. Not all of these designer hybrid dogs being bred are 50 purebred to 50% purebred. It is very common for breeders to breed multi-generation crosses. "This breed needs to be well socialized with different people from an early age. Mine is leary of new people at first. She is not aggressive, but shy. It takes a few days for her to warm up to new people. She is very loyal to her family, particularly me. She follows me around the house wherever I go. She has a moderate energy level. She gets a walk twice a day, and this seems to be perfect for her. She has a very mild shedding. I find a few very fine hairs occasionally. She needs to be groomed regularly to avoid matting under her ears and on her legs. She does well with brushing and blow drying. She does not tolerate heat well, but does very well in the snow. She's not much of a digger, although I have caught her once trying to bury a treat to hide it from our other dog. She rarely barks, only when startled or if she hears a dog bark on television. She has a high prey drive, so I'm not sure how well she would do with cats. Perhaps if introduced early... She responds well to training by positive reinforcement (treats), and is fairly easy to train."